Despite a tradition of releasing range topping dual-GPU graphics cards since 2006, it’s been over two years since we’ve seen a new multi-GPU graphics setup from Nvidia. Back then it was the GeForce GTX 295 1,792MB, tearing up the benchmarks with its dual GT200b GPUs and going head-to-head with the Radeon HD 4870 X2 2GB. Since then, though, Nvidia’s fortunes have dipped and risen like the metaphorical rollercoaster. The first generation of Fermi GPUs, based on the GF100 architecture, proved much too hot, power hungry and noisy even on single-GPU cards. This left the dual-GPU Radeon HD 5970 2GB uncontested as the fastest single graphics card for some time. However, with the significant improvements afforded by the use of low-leakage transistors for non-performance critical components, the revised Fermi GPUs of the GTX 500-series have offered a marked improvement. With their reduced thermal output, it was only a matter of time before we saw Nvidia returning with a range-topping dual-GPU card again. With AMD having played its top-end hand with the Radeon HD 6990 4GB, it's now Team Green’s turn with the GeForce GTX 590 3GB. What’s first apparent is that the GTX 590 3GB is smaller than both the competing HD 6990 4GB and its ageing predecessor, the GTX 295 1,792MB. With a PCB length of 28cm (11in) it’s only a little longer than single-GPU GTX 580 1.5GB cards, and at 1,034g it's 112g lighter than the HD 6990 4GB. 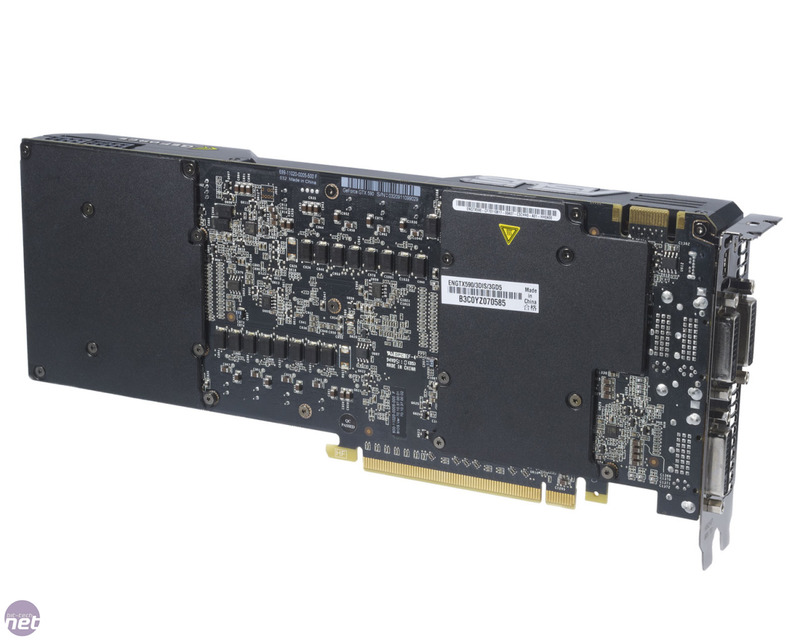 Unlike the GTX 295 1,792MB, which used two slightly cut-down GT200b GPUs, Nvidia has chosen to equip the GTX 590 3GB with two full-specification GF110 GPUs; the same as those found in top-end single-GPU GTX 580 1.5GB cards. However, clock speeds have had to be lowered in comparison to the single-GPU card, and run at a much reduced 607MHz compared with the GTX 580 1.5GB’s 772MHz. This is roughly a 20 per cent drop in clock speed, although the obvious advantage of having two GPUs running in tandem makes the GTX 590 3GB considerably faster on paper. The decision to use such conservative clock speeds might seem odd, but it has allowed Nvidia a good deal of flexibility elsewhere. The most obvious is the card’s cooling system, which shares similarities with both the HD 6990 4GB and Nvidia’s single-PCB version of the GTX 295 1,792MB. The two 520mm² GPUs are arranged symmetrically at either end of the card, with the power delivery circuitry in the middle. Each GPU is topped by its own vapour chamber heatsink assembly, with a single radial fan in the centre of the card blowing air over both. This does mean that half of the card’s heat is exhausted directly into your case, though. Peeking underneath the cooler, you can see that the card’s power delivery circuitry is suitably meaty. Each GPU is serviced by five power phases, with each GPU’s 1.5GB of GDDR5 memory powered by two phases. This means the card boasts a huge 14+1 power phases, all fed by the pair of 8-pin PCI-E power connectors. 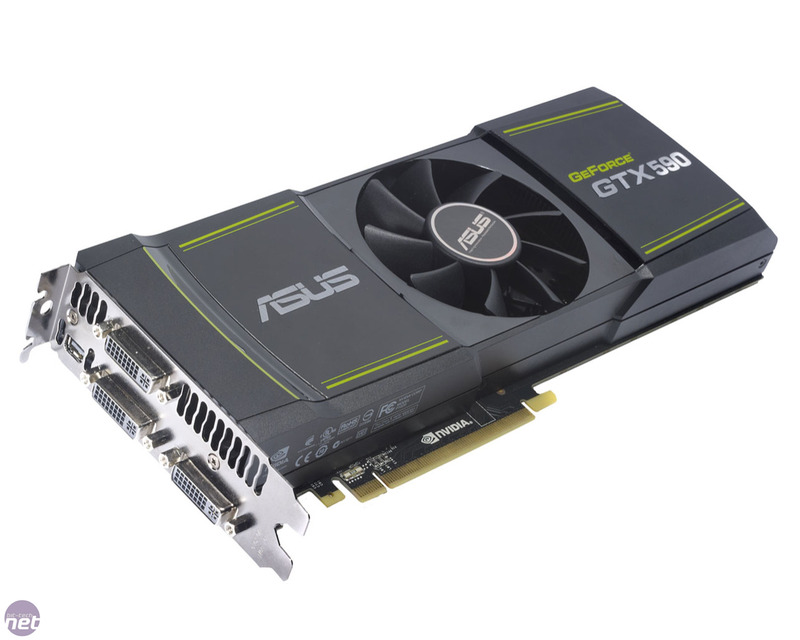 Like the HD 6990 4GB, the GTX 590 3GB breaks the PCI-E power spec of 300W combined board power, but it seems as though manufacturers are now attaching less importance to this standard. Nvidia recommends a 700W PSU for systems running a GTX 590 3GB. With board space at a premium, the card’s 3GB of GDDR5 memory has been split between both sides of the PCB, with six 128MB modules arranged around each GPU, and another six fitted to the reverse, making a total of 24 modules (3,072MB). To cool the memory on the card’s backside, Nvidia has fitted the GTX 590 3GB with two small aluminium backplates. These carry a ‘warning – hot’ label, as they lack active cooling. One extra flourish that we really like is that the Nvidia logo on the top-side of the card is now back-lit. We’ve thought this would be a great idea for ages, and it certainly looks very smart with the GTX 590 3GB fitted into a case with a side-panel window.